I agree with the “ill-designed” comment — no rational person could think that the sequestration process was “well-designed” — but the IMF really doesn’t seem to be troubled about the process, so much as the fact that the cuts were made at all. The IMF report suggests that government spending cuts inevitably hurt economic growth, both in the short term and the long term. The report states, for example, that “indiscriminate” reductions in education, science and infrastructure spending could reduce potential economic growth. Here’s the money quote: the IMF report concludes that the sequestration cuts “should be replaced with a back-loaded mix of entitlement savings (related to healthcare and pensions) and new revenues, along the lines of the administration’s budget proposal.” Let’s deconstruct that conclusion. “Back-loaded” means not right now. “Entitlement savings” means don’t cut government payrolls or government contracts. “New revenues” means raise taxes. In view of the recent experience in Europe and the U.S., it’s hard to believe that reputable entities would continue to insist that government spending creates economic growth, but it’s not surprising that the career bureaucrats at the IMF and its perma-tanned leader, Christine Lagarde, reached such conclusions. The IMF is one of those curious, quasi-governmental entities in the modern world that is supported by government money and interacts with government employees who spend tax dollars. In view of that fact, of course the IMF is going to object to government spending cuts and contend that increased taxes are the only answer. The IMF has zero credibility on what produces true economic growth. It should just shut up about how the United States conducts its economic affairs and be grateful for our substantial contribution. North Korea has got to be the most bizarre country in the world. Cut off from interaction with the rest of the world for decades, run by the military and a ’50s-era communist dictatorial regime, North Korea and its leaders seem to have a hopelessly distorted view of the world. It releases laughable claims about its leaders and their prowess, it issues remarkably aggressive declarations about fighting with South Korea, the United States, and other purported enemies — and then its young leader will put on a big show about watching a basketball game with Dennis Rodman. 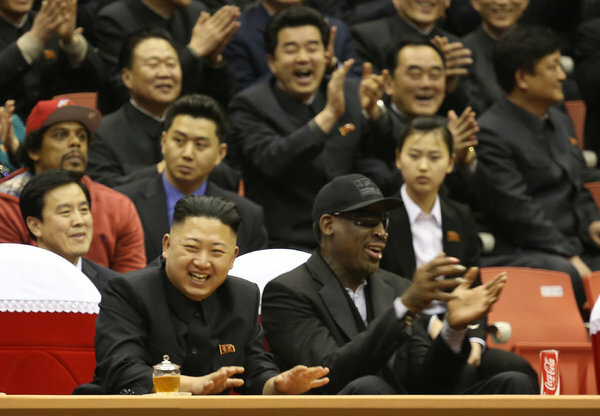 North Korea is so isolated from reality that it apparently doesn’t realize that Dennis Rodman has long since become a comical figure and punch line for his own peculiar behavior. Entertaining an oddball, fringe figure like Rodman does nothing except leave outside observers scratching their heads. It would all be laughable — except that North Korea has an enormous military, missile and (apparently) nuclear capabilities, and a starving population, and within days of Rodman’s visit, North Korea announces that it is withdrawing from its non-aggression agreements with South Korea and that it has the right to issue a pre-emptive nuclear strike. Although North Korea hasn’t followed through on all of its prior threats, the provocative statements of an unbalanced regime have to be taken seriously. It sounds weird to say it, but the reality is that any country so delusional that it thinks hosting Dennis Rodman is a way to show it is a friendly, functioning member of the world community is capable of just about anything.